Tree Climbers International®, Inc. (TCI®) is a worldwide organization of people who love to climb trees. We do this safely and with utmost care for the trees we climb. TCI is also the world's first school for recreational tree climbers. We want the sport of "rope and saddle" tree climbing available everywhere so that everyone can experience the joy and wonder of seeing the world from the heights of the treetops! Peter and Patty (with amazing help) at the top of a Douglas fir. Portland, Oregon, 2012. (Photo courtesy August Schilling)TCI was started by Peter "Treeman" Jenkins, a retired rock and mountain climber-turned tree surgeon (and an ISA-certified arborist). Peter found that the equipment used in rock climbing did not always fit the needs of climbing something alive and fragile as a tree, and many of the rock climbers' techniques were downright dangerous in the treetops! It became clear to Peter that an organization was needed which could bring together people who love tree climbing, as well as train them in the techniques necessary to ensure that they climb safely and responsibly. In 1983, he founded Tree Climbers International and opened the world's first tree climbing school in Atlanta with two big white oak trees, Nimrod and Dianna, and a Mission Statement. Through the years TCI has written safety and training rules that have become standard for recreational tree climbers. Many of our protocols have been adopted by tree climbing schools around the world. Our organization's practices have made it possible for tens of thousands of people to adventure high in the treetops without injuring themselves or the trees being climbed. In fact, to this day there has never been an injury where climbers use TCI techniques and safety protocols for recreational tree climbing activities. In 2005, Peter's wife Patty took over the "operations end" of TCI. While he teaches and is the climbing expert, she runs virtually every other aspect of our operations, maintains our website, and is usually on site at our events. Patty is not a climber (she had polio as a child), but she loves what she does and the people she meets as Executive Director of TCI. Click the links at right to read some of the articles that have been written about us; look through our early publications; and see some of the videos that have been created about tree climbing. There is a great deal of valuable information in these materials, and alot that will make you laugh! do no harm to trees. Provide qualified tree climbing instruction by highly-trained instructors. Produce and distribute educational and inspiring publications to promote safe recreational tree climbing. Create climbing chapters (or "groves" ) in every city, town, or hamlet worldwide. 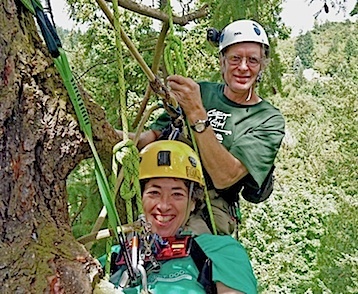 Hold periodic regional, national, and international tree climbing gatherings. Create a communication network of tree climbing enthusiasts through our website and publications. Locate and secure access to climbing trees suitable for recreational climbing. Promote respect and responsibility towards trees and the natural environment. Have fun exploring the high canopy while sharing adventures with like-minded people.